A poem that calls us from the other side of a situation of extremity cannot be judged by simplistic notions of “accuracy” or “truth to life.” It will have to be judged, as Ludwig Wittgenstein said of confession, by its consequences, not by our ability to verify its truth. In fact, the poem might be our only evidence that an event has occurred: it exists for us as the sole trace of an occurrence. Artists do not create in a vacuum; they are indisputably coupled to the society and times in which they work. It may well be that an artist can realize aesthetic triumphs while ignoring society, but willful unconcern regarding social matters is also a political position. The war, what was happening to America, the brutality of the world. What kind of man am I, sitting at home reading magazines, going into frustrated fury about everything — and then going into my studio to adjust a red to a blue? The common wisdom is that people should not talk about two things. This is one of them. I don’t think your everyday entry-level fast food French fryer and one-day-in-the-future museum patron thinks much about the possibilities of incorporating political statements into fractal art. A fractal, to those blessed enough to recognize one, is likely more akin to eye candy — saturated swirls seen on a calendar in Barnes and Noble. Or something vaguely tied to mathematics — more like a theorem than a painting — or a pretty picture intersecting with irrational numbers but never with social, economic, or political concerns. Fractals can be visually stunning — but can they stun others into epiphanies — or just say anything to anyone about his or her life? Should they be used to comment on world affairs, social concerns, or even popular culture? There are some, both proletariat and bourgeoisie, and convinced that fractals have no grounding in the world, who would find such questions absurd. I remember a day last winter when I dropped by to pick up some Giclees from the photographer who handles prints for me. His wife, a painter, studied the fresh prints briefly before laughing. “Well, there’s certainly nothing like this in nature,” she said confidently. “Don’t be so sure,” I replied, pointing to one of the studio’s windows. Outside, the bare branches of an oak tree were reaching skyward to obscure a bank of self-similar clouds. A hypothesis then. If fractals are of this world, then they can also be utilized — politically activated, as it were — to comment upon what happens in it. If one accepts the premise that fractals can be art — and I do — then all the historical/philosophical paradigms and puzzles about the nature of art apply to fractal art as well. Artists, fractal or otherwise, who dabble in and dab on politics to their renders walk some fine lines and climb some slippery slopes. Is one’s art serving as a cry for social reform while still displaying elements of Keats‘ Siamese twins of truth and beauty — still providing a gesture that calls the soul upward? Or does such art become reductive, didactic, polemical — a blunt instrument to bludgeon the viewer into accepting the artist’s point of view? The most apparent problem I see with today’s political art is its deterministic nature. 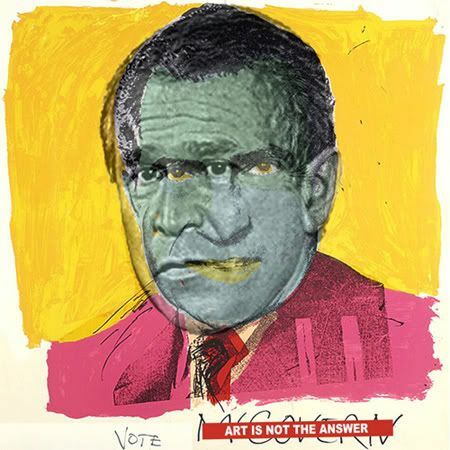 Art often raises salient questions, but when a political artwork is morally motivated, its questions become moral directives disguised as questions. That is, they are rhetorical questions. As such, there is a right way and a wrong way to look at it. A correct answer is always already provided for you by the artist. The questions and the discussions it provokes either support the answer or refute it. And, the value of the work is contingent on its dialectical outcome. From the point of view of the audience, the experience of such political art resembles that of reading an op-ed column in a newspaper. Point well taken. Why are you reading Orbit Trap? Presumably to see and read about fractal art, yes? If you wanted political discussion, you would have pointed your surfboard to Salon or Slate or Daily Kos or Little Green Footballs? Hippie jerk blogger. Bring on more spirals. Maybe it is best to be careful before one gets all socially aware. Suematsu has other complaints with political artists. They assume a ethical superiority but are not required to show that their own expressions are ethically pure. After all, why did I do the piece above about Enron? Was it because I was outraged by the scandal and appalled that the company’s employees were cheated out of their pensions? Or was it because I figured seizing a hot button political topic could help further my career as an artist? And if I lampoon Enron’s directors, don’t I have a reciprocal obligation to show that my motives are not just as crass? And what form would such proof take? How can political artists demonstrate that their intentions are sincere? Testify before a Congressional committee? Undergo short-of-organ-failure questioning while being waterboarded at Guantanamo? Donate all the money made from their fractal art (haaaa!!!) to Feed the Children? Will such philanthropy in turn make my intentions for lashing out at Enron execs as selfless as those of Mother Teresa in your eyes? A child’s drawing of arriving at Terezin Concentration Camp where 15,000 children died. Over the last several years I’ve talked to lots of people about political art and there has been a gradual shift. Before the Iraq War there seemed to be an attitude that political art was out of date or people had a general hostility towards it. But recently I’ve noticed a shift in people’s attitudes. People I have talked to are changing their minds. There are still the purists who believe that any concession will debase the temple of art, but their voice, once supreme in the art world, is now growing weaker. And it is obvious why. Political art might always have a place but in a time of war, and in a time of a rising police state political art becomes a necessity. Some people say that political art has no effect in changing people’s minds, that it is preaching to the converted. To which I would answer…no one ever measured the value of a painting of the crucifixion by how many converts it made. Political art is cumulative in its effect. Its not merely one political print that changes the world. It is a part of a cultural movement. Others, like Jed Perl writing in the New Republic, observe that art cannot always be expediently insulated from life. The artists who find it difficult to turn from the horrors of the morning news to the specialized problems that confront them in their studios are confronting an authentic dilemma, for even ivory towers have doors and windows. While dropping the day’s headlines into the middle of a canvas may never be a way of making a painting, an artist’s far-flung experience must be allowed to seep into the studio, if only in a dialectical way — as a tumult of feelings to which the orderly spirit of a still life or a geometric abstraction offers a much-needed riposte. Am I wrong to show President Bush as a faceless blank slate — as an empty vessel to be filled up with NeoCon nonsense by those shielding him in his no-bad-news bubble? Have I degraded my art or pummeled your temples because I suggest the Enron board is a pack of dogs and that Exxon’s legacy is a horrific oil spill in Alaska. Maybe. I sleep better on those nights. Bush: Generated in QuaSZ. Minimally post-processed. 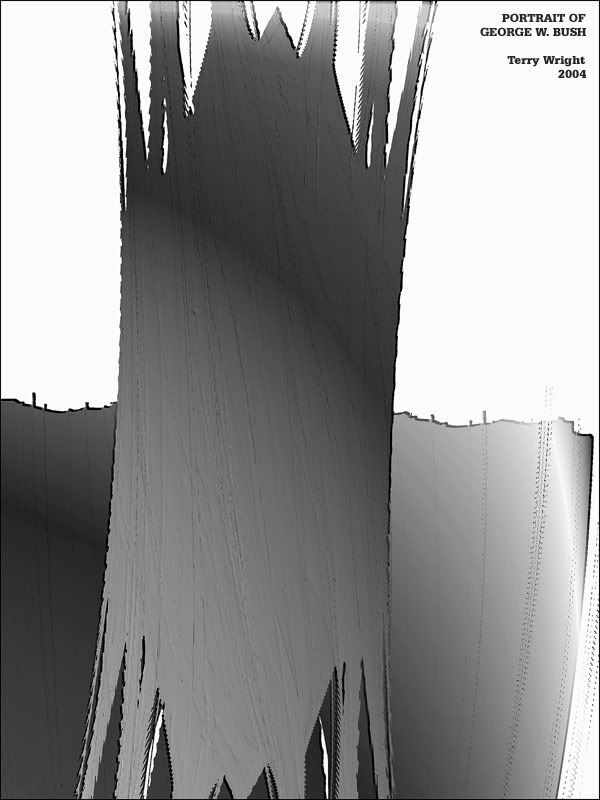 Enron: Generated in Fractal Zplot. Heavily post-processed. Napalm: Generated in Sterling-ware. Heavily post-processed. Exxon: Generated in Dofo-Zon Elite. Heavily post-processed. I don’t think I am going to stick around if this is going to turn into a political board. If I want to see more president-bashing, I’ll turn on CNN or the BBC. This is supposed to be an art community, not a political blog. Since not everyone shares your views, Terry, it makes it a less welcoming place. It certainly is for me. I found this to be an interesting apologia by Terry about what underlies his art. I don’t read it as being political per se; and President Bush is hardly mentioned, never mind bashed. And I would find the discussion equally interesting if it were illuminating a fractal portrait of Hillary Clinton, or whoever. But what do I know: I get all my news from the Daily Show and The Colbert Report. Does giving a political title to a fractal picture make the picture political? Has the politics informed the picture, or is the picture just something to hang the title from? How do my political beliefs and reactions to current affairs affect the way that I work with my fractal generator and graphics program? The way I see it is, visual art is just another medium of expression, like music, theatre or literature. Art has the capacity for expression; what it expresses is determined by the artist. Fractal art, as I think Mark is pointing out, is a little more challenging as a direct or literal medium of expression, probably because it is abstract and non-representational and political thoughts usually deal with concrete things, like policy –how should we act; how should be deal with an issue? So with fractals and other abstract work, it’s intended meaning is only one of many possibilities. Take away the title words, and the same image could be used for something else, in another, unrelated context. The image itself is not making a statement, not like say, Goya’s famous scene of the man being executed by a firing squad at night in front of a wall with his arms stretched out. How about Guernica? Pull the title off and write, say, “car accident” or “Kent State” or any shocking, brutal event. That’s one of the great and also frustrating things about abstract art: it’s anonymous; it “represents” reality, but it’s abstracted, reduced to the essence of concrete things which are found in many different places and forms. I think one of the best examples of political art is the Greek Orthodox Icons. Very abstracted and yet deliberately made to express the results of deep contemplation and reflection. Naturally, they were subject to numerous conflicting interpretations and meanings, but the artist was trying to express something that writing and music, and all other mediums could not do quite as well. I would say visual art has it’s own language and expresses somethings better than other mediums and in that way complements the written and musical mediums. Quote 1: I do not believe that art is a luxury of civilisation; I believe it is a vital necessity for the making of civilization endurable. Perhaps for Terry that quote may hold intensely true – as he uses his art to clear/cleanse/purge? his soul of the ‘pain’ of this world as he sees it. His right as both a human and an artist. Quote 2: The emotional reaction to beauty as expressed in music, painting, scultpure and poetry, derives from precisely the same source as profound emotional reactions to personalities. If that is true, then a negative or positve reaction to a work would have more to do with the feelings that a viewer feels are expressed by the artist, than the actual work and its elements. If I feel nothing for a work of art does it show that I am lacking in artistic interpretation, or apathetic, or soulless! Or does it just mean that I don’t feel the artist’s emotions? That he or she has not expressed them strongly enough. Or does it mean that I have learned to protect myself from incursions into my spirit that show me the fear that I – perhaps – keep deeply hidden? I saw a Crosby, Stills, Nash and Young concert a couple of weeks ago. They called it the freedom of speech tour. Every song, except a few of their hits, was politically charged, but all that mattered to me was that Neil Young snapped his guitar strings in the last song. I enjoyed every second of the concert and I had no problem with them expressing themselves through their music. Did I agree with their message? It doesn’t matter. 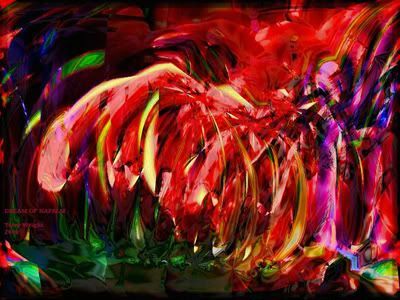 Since fractal art is basically abstract art, about the only way to make a political statement with it is via the title given to the image and/or to a description of the image. The image “Portrait of George W. Bush (2004)” could just as easily been given the name “Portrait of John Kerry (2004)”, or named for any of dozens of politicians. The image itself carries no political meaning, but rather the title gives the political content. Granted, the title given to an image can give insight to the viewer as to what message the artist intended to convey to the viewer, or insight into the thought process behind the image. This can often be useful to the viewer. Me, being rather simple minded when viewing art, I either like it or not, and don’t really care whether or not the image is titled. As for fractal art being politically motivated, that’s really up to the artist to choose. But, as I said initially, it’s going to be the title and/or description that carries the political content. This is also pretty much true regardless of the motivation behind the art. I have places where I go to get political commentary. This blog isn’t going to be one of them. But, since I didn’t create it, it’s not for me to say that the contributors shouldn’t make political statements. But, as a reader, I’ll likely consider such commentary as amateurish or borish and ignore it. 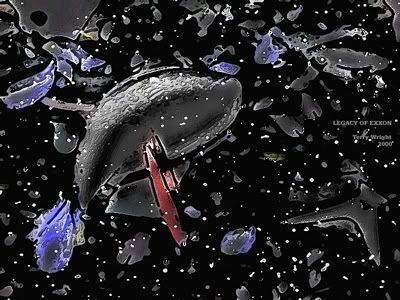 Simply because fractal art is non-representational does not mean that its content is neutral — especially when the artist’s intentions, conveyed through titling, are known. Viewers are always free to interpret a given work of art as they wish. However, even if disregarded, the artist’s intentions do not necessarily vanish because the viewer has chosen a different frame of reference. Nor do I believe titles are interchangeable without significantly and intrinsically altering the semiotics of a given work. 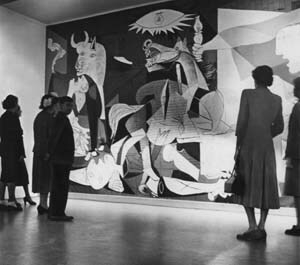 Picasso’s Guernica, whatever else viewers might see in it, will forever be linked to the misery caused by a horrific aerial bombardment of civilians during the Spanish Civil War. And, seriously, would Guernica have had the same impact — and still be considered such a dramatic testimony to the brutality of war — if Picasso had instead called the painting Bad Hair Day. Besides, if some of the people I cite in my post are correct, using an innocuous generic title for your fractal art based on nature or integers or fantasy won’t get you off the hook. Selecting a non-political title is still a conscious, deliberate, political action. George Orwell would say everything is political. Sigmund Freud said that everything is sexual. Dali might say everything is bicycle. Political cartoons are not abstract artwork and yet almost always contain labels on the elements in them. In fact, it’s almost become part of the style of political cartoons to label people and objects in them with the names of politicians or political organizations. Although the artwork has meaning on it’s own, it’s symbolic and generic. The artist has to label the elements so the audience doesn’t have to guess what current news event he’s referring to. Guernica is a good example because, as Terry pointed out, it could have been labelled differently and it would have made a much different impression on it’s audience (it would have made life a lot easier for Picasso too). Guernica symbolises brute force and panic in general. But Guernica inspired it and Picasso gave it that title. If you know nothing of Guernica (and if you do it’s probably because of Picasso’s painting) you can still feel the terror and panic it expresses. I saw Guernica exhibited in Spain once. I was surprised to see that it’s the size of a large wall mural. It’s also encased in bomb and bullet proof glass and has real security guards around it (not just the usual kind that walk around art galleries giving directions to the bathroom). Picasso has immortalized the events in Guernica in a way that no writer, historian or musician has been able to do. We “see” Guernica, but we don’t “read” or “hear” about it anymore. Art is a powerful mode of expression. Why not use it to educate and enlighten people as well as to entertain them? Or really, the question ought to be: Why would would you want to limit art to mere entertainment? 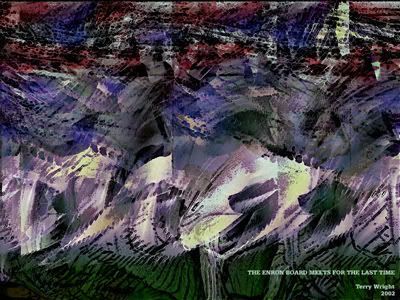 Fractals in politics and art coexist, as in the symbiosis of politics and art. Politics is intrinsically fractal, as described at http://www.americaontrial.biz ; and Art is inherently political, hence the use of the one in the other is inescapable, isn’t it?